Jacques Yves Cousteau was the twentieth century's best-known advocate for marine environmental protection. He produced 115 documentary films and television programs about adventures on his research ship, Calypso. He was also the coinventor of the aqualung or "scuba" tank. Cousteau achieved international fame with his role as narrator and star of the television series The Undersea World of Jacques Cousteau. During his lifetime, he received numerous awards and honors. Among them were three Oscars and ten Emmy Awards for his films and television programs and the U.N.'s International Environmental Prize in 1977. Cousteau trained as a pilot at the French naval academy, but injuries from an auto accident in 1933 prevented him from pursuing an aviation career. Soon thereafter he developed an interest in the undersea world and became obsessed with developing snorkels, bodysuits, and other diving gear. In the early 1940s he worked with a Parisian engineer to invent a regulator for a compressed air tank, a self-contained apparatus that allowed free movement and breathing underwater. Scuba diving was thus born. Scuba was a great improvement over the heavy diving suits used at the time. Cousteau used scuba to help the French resistance during World War II and was awarded the Légion d'Honneur for his service. 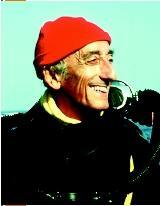 After the war, Cousteau developed scuba diving as part of a French naval research group. He also wanted to challenge age-old superstitions and open the undersea world to scientific exploration. Cousteau was initially known for his 1953 best-selling book The Silent World. A film by the same title won a 1957 Academy Award for best documentary. Cousteau became director of the Oceanographic Institute of Monaco and, in that position, led a successful campaign to stop nuclear waste dumping in the Mediterranean. He also established experiments on deep undersea living near the continental shelf called Conshelf I, II, and III. Much of his environmental work was conducted by an organization he founded in 1973, the Cousteau Society. SEE ALSO O CEAN D UMPING . DuTemple, Lesley A. (2000). Jacques Cousteau. Minneapolis, MN: Lerner Publishing Group. King, Roger. (2000). Jacques Cousteau and the Undersea World. Broomall, PA: Chelsea House Publishers. Cousteau Society. "Cousteau People: Jacques Cousteau, Founder." Available from http://www.cousteausociety.org/tcs_people.html .